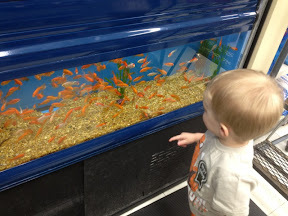 Ever since Tristan was a tiny baby, when he and I would go out shopping or something on our own I would tell him we were going on an adventure. On Friday we ran out of dog food and were running low on treasures for the potty treasure box, so we loaded up and headed on an adventure. 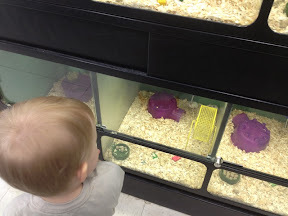 As soon as we turned into Merritt's Creek Farm (home to Target, the pet store, Home Depot, Dollar Tree and lots more) he started saying he wanted to go see the mice at the pet store. 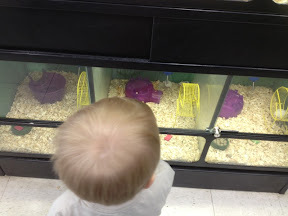 We went to Target to get treasures for the treasure box in the 1Spot, then headed to the pet store. The mice are his favorite, so they got a double look! 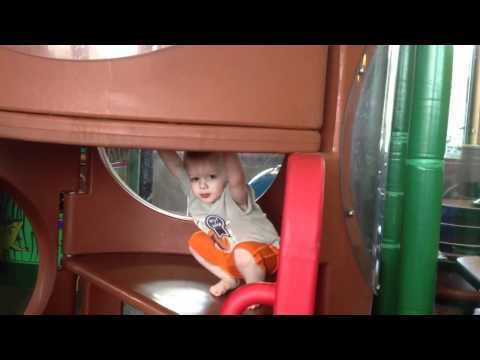 Then we got back in the car and headed to Chik-Fil-A to eat and play. He didn't eat much ("I'm done. I need to go play now. "), but when I was finished we went into the play area. It was packed! A GIANT sign says "3 and Under Play Area," so naturally only one kid was in the age bracket and the rest looked to be about 10, one girl looked about 12! They were running and screaming and I was afraid Tristan would get trampled. The good news is, he was worried, too! He stayed pretty close to me until they kids left. He kept wanting to go down the "swicky slide" (I'm pretty sure it's really just an enclosed climber), but was scared to death with all the big kids making such a racket and running up and down it. At last it was just me and him. "Swicky slide" time!